Content Locking is a simple way which is applied on the websites to lock the content of the website with semi-transparent frame using some software. If the website visitor wants to see the content then first he has to do some action. Actually content locking is a process of providing incentive to the visitor to complete as action. Good thing is that Content Locking offers many benefits but the drawback of it is that it can annoy your website visitors if it is not implemented properly. If it is done properly then it can generate leads and achieve your marketing goals. 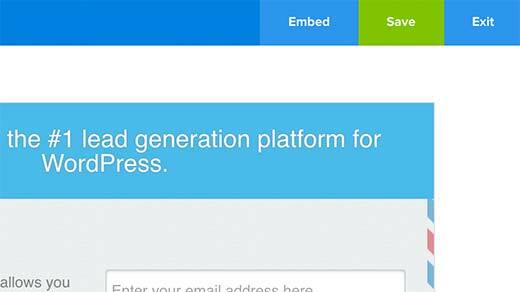 During WordPress website development itself the developer can install the required plugin to do content locking if requires. The best way to use content locking is when you are providing highly valuable content such as an ebook download, a research report which is highly sought after, a tutorial or a free course or something similar. It helps in increasing the lead generation. It helps in Increasing sales. It helps in building an email list with so many regular and new entries everyday. It helps in building a loyal list of customers which like your content. These are the reasons why many website owners want to add this feature into their WordPress site. In this article we will discuss about how to add content locking in WordPress without making the website visitors unhappy or unsatisfied which is very important. The website visitors should happily and eagerly enter the information you are asking in the content locking event happening when they are trying to access content at your WordPress site. 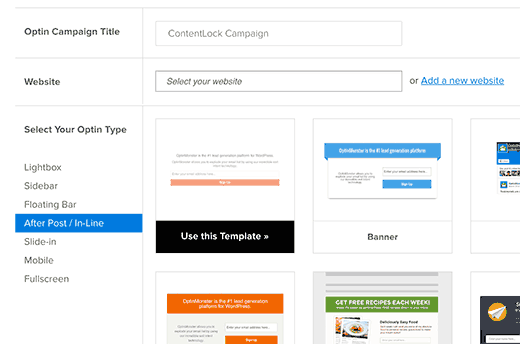 Content Locking uses psychological methods to attract visitors and do certain actions. The visitors will not mind performing a little task in exchange of highly valuable and usable content. Now you must have come to know what Content Locking is and when to use it, now let’s see how you can easily add content locking feature in your WordPress site like a professional. How to do Content Locking in WordPress? 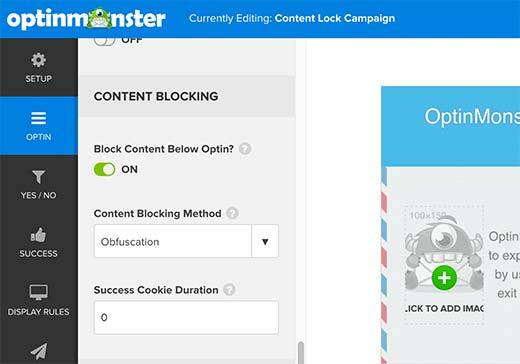 In this article, we will discuss about doing content locking in WordPress using a WordPress plugin called OptinMonster. It is one of the best lead generation solution available in the market. 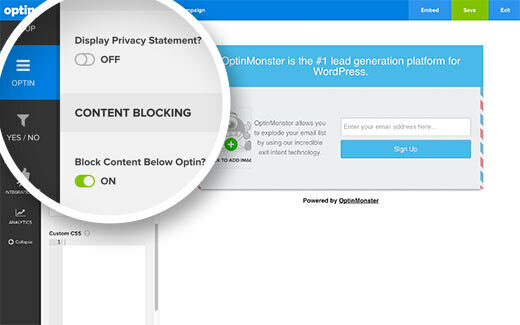 You need a pro plan of OptinMonster to perform content locking at your site. You can also get different kinds of discounts available from their site. If you want to do content locking at your WordPress site then first thing you have to do is install and activate this OptinMonster Plugin by downloading it from their site or from WordPress.org repository as given above. 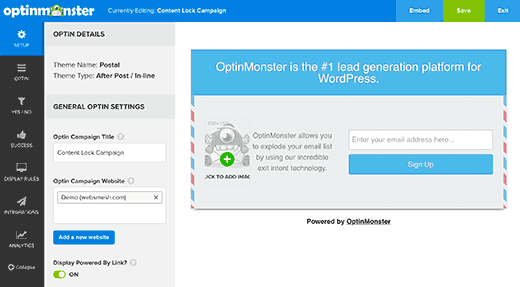 OptimMonster plugin works as a connector between your OptinMonster Account and your WordPress website . After activation you just click on the OptinMonster menu item in your WordPress admin bar. 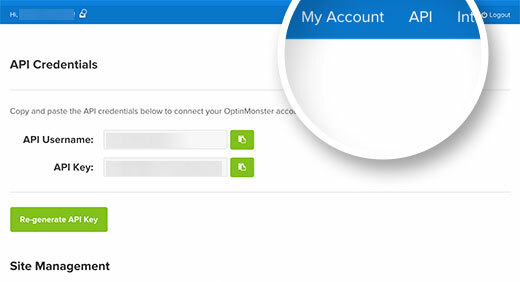 Here you to enter the OptinMonster API username and key. You can enter the API information after checking it under your account on the OptinMonster website and clicking on the API link. 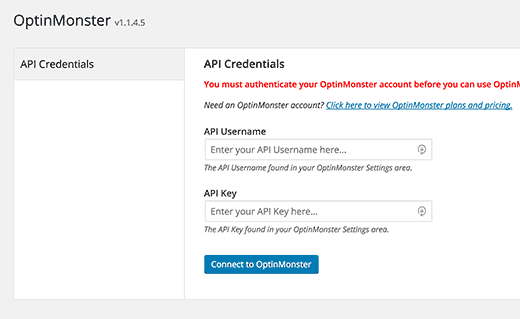 Now copy and paste the API user name and key into the OptinMonster plugin page and then click on connect to OptinMonster Button. After you are successfully connected, you have to click on the create new Optin button. They will lead you to the OptinMonster website. Now you have to provide a title for your optin campaign and just select your website from the drop down menu. Here you can see the different headings under ‘Select Your Optin Type’. Just Select your choice in ‘After Post/In-Line’ option. This will load some templates which are ready to use in the right column. Now you just need to click on any template to use it. This will open form builder of OptinMonster and here you can customize the appearance of your optin and configure its settings. You can also edit fonts, change colors, add test or images etc. Next step is to click on the ‘Optin’ Menu and then scroll down to content blocking section. Here just turn on the content blocking switch for this optin by clicking the on/off switch. When you turn it on then it will show you the options to decide how you want content blocking to work. First you have to choose a content blocking method. Here You can use options such as obfuscation which blurs the content below or removal which totally removes the content below optin. You should also change the success cookie duration to 0. This will prevent the cookie from being set until users submits the optin form. After this, just go through the integration settings to connect your email marketing service and also configure the analytics settings. After you completed these steps, click on the Save button on the top right corner of the builder to save the settings. Now you should visit your WordPress site and click on the OptinMaster menu. Here you will see your content lock optin under the list of optins. If you face any problem viewing this then just click on refresh optins button. Now click on the ‘Edit optin output settings’ link and on the next page just click on the checkbox below ‘Enable optin on site’ option. Now click on the save settings button at the bottom of the page and then click on the OptinMonster menu again to go back to Optins overview page. From here you have to copy the optin slug. Now you have to edit the post or page where you want to enable content locking and add this shortcode before any other content in your post or just after the first paragraph. Here replace your Optin-slug with the Optin slug you have copied earlier. Now you just save and publish your post or page and then visit the post or page in a new browser window to see that content locking is working fine. How to Add Content Locking to All other WordPress Posts? If you want to automatically add content locking to all of your WordPress posts then you can accomplish this with an easier way i.e. By simply installing and activating the Insert Post Ads Plugin. 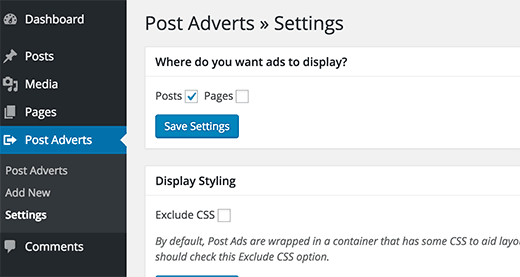 After activating it, just visit the Post Adverts >> Settings to configure the plugin settings. Now select where you want to enable post ads plugin posts or pages and then just click on save settings button. 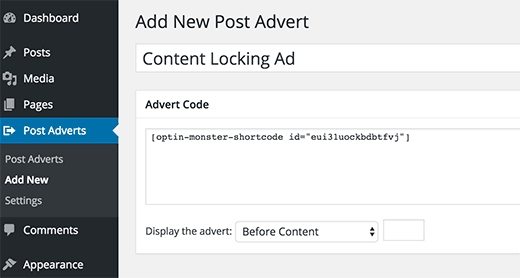 Now you have to visit Post Adverts >> Add New page and provide a title for this content locking script and then add your content lock optin shortcode in the advert code section. Now select your choice under the ‘Display the advert’ dropdown menu i.e. Select between before the content or to add this after the first paragraph and click on the publish button. That’s it. 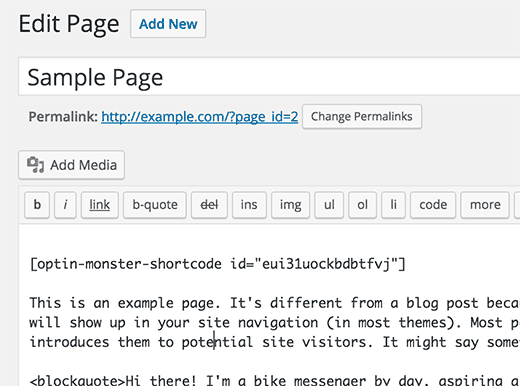 Now the plugin will enable content locking for all of your WordPress posts or pages. We hope that by going through this article you must have learnt one of the most popular and easy way to add content locking to your WordPress site.